Every year brings exciting new things to do in Pigeon Forge, and 2017 is no exception. To help you find the best new things to do in the Smokies, we've made this guide so you can discover the top 10 new attractions and activities in Pigeon Forge! Even if you've been to the Smoky Mountains many times before, it's always worth coming back to see the incredible new attractions that spring up year after year. So what are the new things to you can see in Pigeon Forge for 2017? "Lightning Rod" was easily one of the most anticipated new rides Dollywood has ever built. And it's no secret why. This innovative coaster broke several records, including being the fastest wooden roller coaster in the world and it also holds the title of being the first "wooden launch coaster" in existence. Though "Lightning Rod" debuted in 2016, construction delays and technical difficulties prevented many park goers from experiencing it. Now that these issues are resolved, 2017 will be the year you can experience the fastest wooden roller coaster in the world at this iconic Smoky Mountain theme park. In addition to having "Lighting Rod" fully operational, Dollywood will also debut 3 rides and 2 new special events. These rides are scheduled to be ready by summer of 2017. Drop Line Tower – Experience a 200-ft free fall at this new Drop Tower in Dollywood's Timber Canyon. Tail Spin Racer – This exciting new slide at Dollywood Splash Country lets you race your friends and family as you slide down high-speed AquaTubes to a big splash finish. Whistle Punk Chaser – This new junior coaster for children with thrilling twists and turns. During Dollywood's annual Fall Harvest Festival, families can experience the Great Pumpkin LumiNights Event. In spring 2017, Dollywood will also add "Enra," a performance dance troupe, to their lineup of excellent live shows. This Japanese dance company is well-known for their dazzling light and video displays and they even appeared on America's Got Talent. 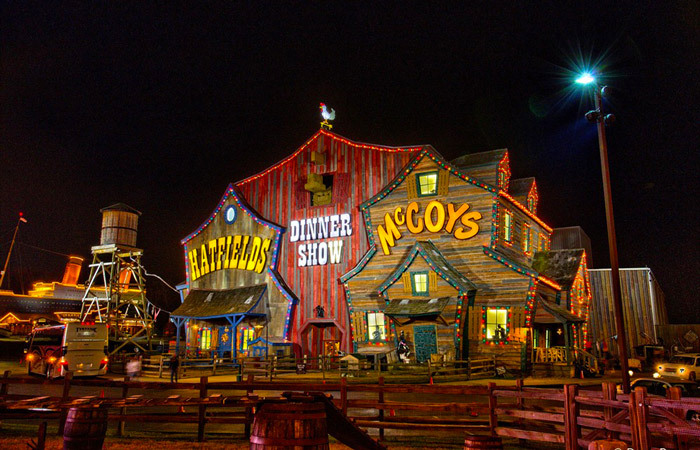 The Hatfield & McCoy Dinner Show is a popular Pigeon Forge Dinner Theater that's getting a $2 million renovation for 2017! In particular, the new renovations feature a hi-dive board and a 22' diving well, so visitors can look forward to seeing diving hillbillies at this show. The renovations are to be completed by late spring 2017. Along with hilarious diving stunts, trained diving dogs and waddling ducks will also be a part of the new show. Better yet, the Hatfield & McCoy Dinner show will still feature lots of fantastic live music, hilarious bits, hillbilly clogging, and fun barnyard animals. Do you love learning about the history of crimes and infamous criminals in America's history? Be sure to stop by this exciting attraction in the heart of Pigeon Forge, TN when you visit in 2017! Moonshine distilleries and tasting rooms are popular features in Pigeon Forge and they offer a unique way to experience the local culture of Southern Appalachia. The Smith Creek Moonshine tasting room is one of the newest places you can sample authentic moonshine in the Smokies. Better yet, this new moonshine store is conveniently located in Tanger Outlets in Pigeon Forge! While you're out on a shopping trip, be sure to stop by to sample a refreshing beverage and check out the store with moonshine, jams, sauces, dry rubs, and more. As one of the newest attractions in Pigeon Forge, the Top Jump Trampoline Park is a fantastic addition to the Pigeon Forge Parkway. This exciting indoor attraction is the perfect place for kids to bounce out their energy and it's also a great backup plan if your Smoky Mountain plans get rained out. When you visit this new trampoline park in Pigeon Forge, be sure to check out the TopDunk Court, the Clip 'n Climb, Ninja Course, the Gladiator Pit, or the Extreme Dodge Ball Arena. Foxfire Mountain is an action-packed adventure park near Pigeon Forge that features Zip Lines, a waterfall canopy tour, an aerial adventure course, and ATV Tours. This unique attraction, operated out of an old family farm, is also home to the longest swinging bridge in America. As of 2017, Foxfire has added a Craft Cidery that produces hard and soft ciders. Stop by the Wyile Cider Barn to sample ciders in Tennessee's only craft cidery! Located just north of Pigeon Forge, you'll find Sevier Air, a new family adventure park that comes complete with trampolines and challenging ninja warrior course. With 38,000 sq-ft of space, this expansive adventure park offers plenty of thrills and fun for the whole family! In nearby Gatlinburg, the local community is abuzz with excitement about Anakeesta Village, a new development slated to open in Spring of 2017. This Anakeesta Village is comprised of two parts. The first area will be located right on the Gatlinburg Parkway in Gatlinburg's charming downtown area. Here, visitors will enjoy a variety of shops, restaurants, and an outdoor plaza. From here, vacationers will be able to take an aerial lift to the Anakeesta Mountain area that sits on property adjacent to the Great Smoky Mountains National Park. This area will feature tree canopy tours, zip lines, a drop tower, and an observation deck with 360° views of Gatlinburg. This beautiful property is located near the Arrowmont School for Arts & Crafts and it promises to be a fantastic addition to Gatlinburg's vibrant entertainment scene. After Dolly Parton's Successful made for television movie, about her childhood, Dolly plans to open a new Dinner Show celebrating her family and the culture that shaped her childhood. To honor these influences, Dolly plans to open Dolly Parton's Smoky Mountain Adventures Dinner Show in 2017! The new show will be located in the former Lumberjack Adventure theater near the Island in Pigeon Forge and will begin showing in Spring 2017. The Smoky Mountains is ecstatic to have a new dinner show with Dolly Parton's personal touch! 2017 is shaping up to be an incredible year to see the Smoky Mountains. What's your favorite new attraction or activity in Pigeon Forge? We'd love to hear your thoughts in our comments section! Ready to see what's new in Pigeon Forge? Simply call our reservations office at (865) 429-4121 or use our cabin finder tool to find lodging for your next vacation to the Smoky Mountains!